I've enjoyed my Feral watch for some time now, but it's time I started expanding the watch collection. Soooo...my "collection" now consists of two! This new map print watch from Style Girl is adorable and perfect for any brown-accented outfits of mine. And with these sandals from Just Fab getting so much love, I'm bound to be having a lot more browns showing up in my outfits. So the title of this post is dedicated to a humorous moment from earlier in the year. I often get frustrated with myself over how slow I take in opening up to others. I'm this bashful little turtle that hides in her shell half the year, and finally when the semester is almost over, I emerge from my barrier and make connections. In the past month, I've befriended a couple of my fellow senators, and I'm sad to see our year come to an end so quickly. If only I'd been less shy and reserved! To all you extroverts, I envy your ease at this socializing thing. Anyway, some senators and I had gotten onto the topic of art and my background came up. The guy sitting across from me waved his hand up and down my seated frame and said, "You even dress like a piece of work!" I busted out laughing and asked him to clarify just what kind of work he meant. Everytime I think of it, I have to chuckle a bit. 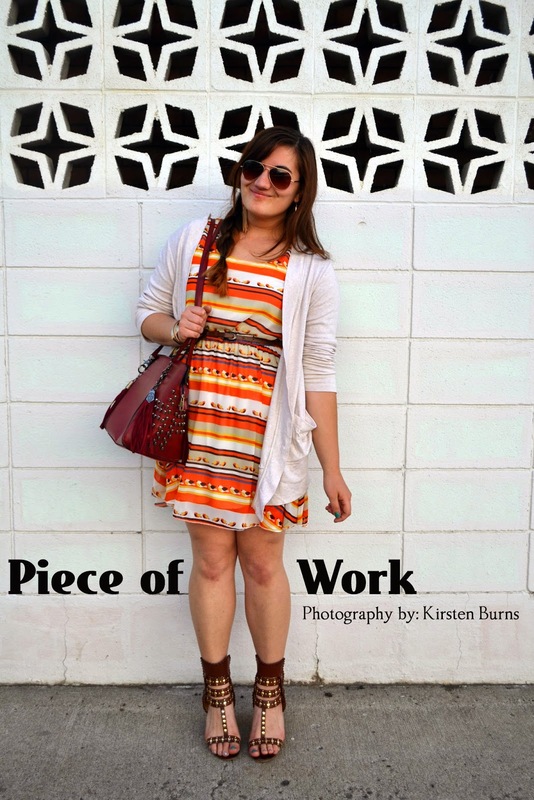 Yes, I'm just a "piece of work." So it's become our joke, and at the end of our last Senate meeting, he'd written a sentimental commentary for each Senator that was leaving. When he reached my name, I was pleasantly surprised by what he said. It's odd to think how other's might view you. I often worry others mistake my shyness for obnoxiousness. My style doesn't quite match up to my reserved nature! However, perhaps it's because I let this particular person see the real me, he was able to understand my character better. I can't quite piece together his exact words in my memory, but it went along the lines that despite my shy exterior, it hid an engaging and vibrant personality that he felt lucky he'd gotten to know. Of course, he also had to throw in the "piece of work" comment towards the end too. As I've grown older, I've become more comfortable with my role as a loner. Before, I would gaze wistfully at my giggly, loud, and obnoxious peers, wishing I was a part of their shenanigans. However, it all felt so fake to me, and I couldn't force that level of hyperness or shrillness...ahh, high school. Today, I feel as if I've grown more gracefully into my quiet personality, and I'm content with it. Those who take the time get to know me will discover the hidden layers of goofiness, wit, and opinions that exist underneath the somber exterior. For now, I like to let my clothes do the talking! Loving the fun orange colors in this dress! I have that same watch but the glass broke so I'm a bit devastated!! tara and i have a map watch too, they are awesome, i see why you have two now haha! anyway, loving this outfit, those shoes are gorgeos! This kind of outfits (brown/orange colors) always remains me of you. Your watch is fantastic.I have never seen a map watch :D it is very cool!! Gorgeous dress and accessories Linda! I would never think you were shy. You exude so much personality in what you wear. You always look nice. Thank you as well for all of your sweet words, it was really wonderful to hear them (well, read them) and that was so kind. You're such a doll you sweet girl you! I'm surprised that you're so shy because you've always said that you dress differently from the others in your area and people tend to look at you. Usually shy people don't like to stand out so there must be something inside of you that overrides the shyness. Some "alone" time is always welcome but it's always good to socialize and you should really try to overcome the shyness because you sound like such a fun person and someone that people would love to call their friend. You look lovely in this dress. Wow! This outfit is one of my favorites by you. I just love everything...Your colorful dress which reminds me of a sunset, your wordly watch, and those gladiator heeled sandals! Uhh those heels.. so jealous! What a nice dress and that watch - man, that is a thing of beauty! 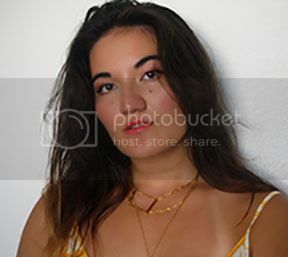 Hi Linda, I would also never guess that you were reserved, but I love that your style reflects another part of you, its full of confidence and very bold and fearless. The watch is really cute and adore those heels. Happy Weekend hun! Sometimes being extroverted gets awkward lol, you talk too much, freak people out, say the wrong things...grass is always greener, right? Love that watch btw! Oh, yes, Linda, I feel ya! Ain't nothing wrong with a good ole introvert ;) And I would have to agree, you're ensemble definitely scream social butterfly (if that'a even possible?)! I love the loud print of your dress and the orange hues look great on you :) And I totally want your map watch - how neat is that?! I used to be painfully shy, but I think having jobs where I had to give public presentations helped me a lot. I'm a lot better now. I love your whole outfit here. love your sandals, I've been looking for something like that for summer. love the map print watch too. Loving your dress and those sandals!!! Perfect for summer! Hehehe, we are so alike, Miss Linda! Every post I read of yours I feel more and more like we'd be biffles (yeah, that's totally how you read BFFs) in real life. I'm slow to open up, too, and still remain introverted. But once you get inside, I can crack a joke and make some sick puns, too. It's funny how much more social we are on the internet, yea? Aaah this outfit is gorgeous on you. Bright citrus colors really suit you, you know that? And those heels are just my favorite of yours lately!! Have a splendid rest of the week, Linda! I can't seem to open your post "I'm my own paparazzi" for some reason, A message appears saying that this page doesn't exist. ive already commented on this post, but i just wanted to say your new layout is so cool! i absolutely love the design, so fresh and cool!! love love love! I love orange and red together. Awesome bojo look here! And your watch! I love things with maps. I was just gifted a very similar watch from Urban Outfitters for my birthday. I haven't stopped wearing it since I got it! Love the sequence, your title, lost and background all work so ell together! Love your Aztec dress, and those gorgeous gladiator sandals and studded bag. And goshhhh your shoes <3 Serious love for them! great detail on the bag! It was great hearing your thoughts, have a splendid week ahead! I love the new layout Linda! it's very summer and looks so refreshing. Also, I love your sandals!! gahhhhh they look like the Isabel Marant pair I dream of!!!! nice new layout, Linda! I totally like it! ;) especially the header. very very cool! and your outfit is lovely as well. those sandals and the bag are such awesome pieces and they go just perfectly with the happy shiny dress. And I am in love with your sandals!!!! amazing colors! and those sandals are becoming my fave!! it looks so nice with your outfit!!! i love reading what you shared in this post. I couldn't agree more to the fact that the way we dress sometimes is already enough to show our personality.